The podcast series The History of Philosophy without any Gaps has arrived at the early medieval period. The first major philosopher to be covered is Irishman John Scottus Eriugena. Episode 197: “Charles in Charge: The Carolingian Renaissance” gives an introduction to the growth of learning in France in the years before Eriugena. The focus is on the star of Charlemagne’s court, the philosopher Alcuin of York. The court was also home to many Irish scholars such as Clemens Scotus (teacher, at court before Alcuin), Joseph Scottus (a poet and scholar who probably accompanied Alcuin), Dungal of Bobbio (teacher and astronomer), Dicuil (geographer), Donatus of Fiesole (teacher), Cruindmelus (teacher), and Cadac-Andreas (scholar). This reflects the focus the Carolingian Court had on education and learning, which drew in scholars from all over Europe. It also shows the wide range of learning held by Irish monks. 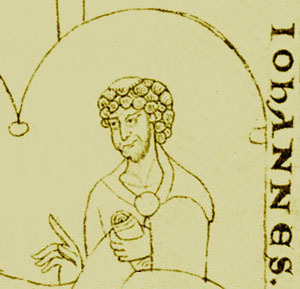 Eriugena was associated with the court of Charles the Bald, grandson of Charlemagne. Like his grandfather and father (Louis the Pious), Charles surrounded himself with scholars, including at least two Irishmen: Martianus Hiberniensis and John Scottus Eriugena. Episode 198: “Grace Notes: Eriugena and the Predestination Controversy” discusses a debate around predestination that occurred in the court between Hincmar, archbishop of Reims, and the monk Gottschalk; and Eriugena’s intervention in it. The central question was, if all things are willed by God, why are humans punished for what they do? The question is still current today in a different form, in debates about free will. Epidoe 199: “Much Ado About Nothing: Eriugena’s Periphyseon” examines Eriugena’s masterpiece of theology and metaphysics, the Periphyseon. This draws on neoPlatonist ideas to describe the nature of reality. (For more on neoPlatonism see the sections on Late Antiquity and the great influence on Eriugena, Pseudo-Dionysius. ← What ish my nation?